1. Cohen, S., Tyrrell, D. A. J., & Smith, A. P. (1991). Psychological stress and susceptibility to the common cold. New England Journal of Medicine, 325, 606-612. 2. Henderson, A. S., Byrne, D. G. and Duncan-Jones, P. (1981). Neurosis and the social environment. New York: Academic Press. Modified. The scale administered in BCS and PCS3 is a shortened version of 71-item List of Recent Experiences (Henderson et al., 1981). Respondents are asked to indicate whether they experienced each of 21 specific life events and 3 optional events during the past 12 months. The scale includes events that normatively are considered to be negative (e.g., deaths, crime) as well as events that are more ambiguous (e.g., change in finances, relocating). The scale also includes a single positive event (success at school or work). 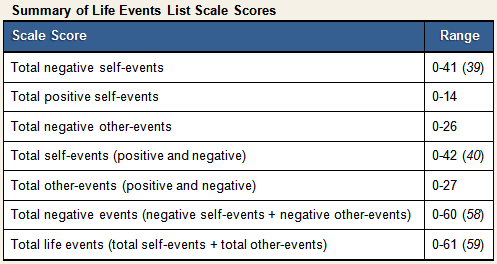 Ambiguous events are followed by a clarification item whereby respondents report on their feelings about the event using a 6-point rating scale (See Scaling). Most items are presented with dichotomous response options (yes/no) and/or checklists that require participants to indicate whether an event occurred to any of several individuals. The following rating scale is presented with the clarification question that follows items that inquire about events that are ambiguous in terms of valence. How would you rate your feelings about this event? Have you or your spouse/partner or other member of your immediate family been assaulted or mugged during the last 12 months? Has there been a significant change in your personal finances in the last 12 months? The primary variables that can be derived from the Life Events List are presented in the table below. Detailed information on scale scoring is available elsewhere (click on 'Scales'). Due to a copy-editing error, the Life Events List administered in PCS3 combined deaths of siblings, children, and other relatives into a single response, thus reducing the potential number of negative life events by 2. The adjusted maximum scores for the relevant variables appear in parentheses in the Range column of the above table.